Want a closer connection with your kids, but feel like you’re hitting a roadblock? This 6 hour DVD offers key ideas for breaking through.Parenting is hard, and we all know our kids weren’t born with an instruction manual. 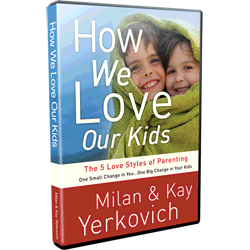 In this audio workshop, Kay and Milan Yerkovich continue exploring the powerful tool of attachment theory introduced in “How We Love” and discover the unseen forces that influence every interaction you have with your kids. What is a core pattern?